The days of abundant vegetable gardens and outdoor farmers’ markets may have come to an end, but that’s no excuse to stop eating healthy! In fact, there are many flavors that reach their peak after the season’s first frost! ’Tis the season for kale, Brussels sprouts, sweet potatoes, winter squash, and citrus fruits shipped in from warmer climes. We asked several registered dietitian nutritionists to share their top tips for food shopping and meal prepping during the winter season. 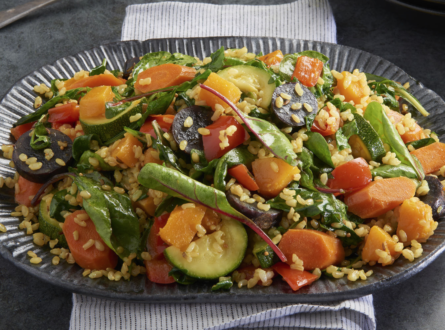 You can use your Thermomix® to make the most of seasonal winter vegetables. Swap in seasonal veggies on this Roasted Vegetable Pizza, or try this Roasted Cauliflower and Kale Soup featuring two of winter’s star veggies. This delicious Vegetarian Chili made in your Thermomix® makes the use of canned beans and tomatoes for a hearty winter meal. Thermomix® makes making soups easy with vegetable soups you can get on the table in less than 30 minutes, such as Butternut Squash and Apple Soup, Creamy Mushroom Soup, and Creamy Tomato Soup. Try whipping up a big batch of Oatmeal or Apple and Pear Hot Cereal in your Thermomix® for a warming breakfast you can eat all week. Want to see how Thermomix® can help you make healthy, delicious meals like the ones in this article? Click here to book a demo!